Makes a sound like "diu diu diu"
The Fulong Old Caoling Railway Tunnel was opened in 1924 at a length of 2,167 meters (1.34 miles). Because of the tropical climate of Taiwan, the condensation from the ceiling of the tunnel frequently dripped onto the roofs of the trains as they passed through. 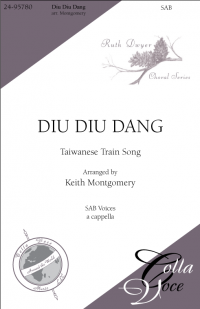 This folk song is about the drip-drop (“diu diu”) sound that the passengers used to hear as they rode the old locomotives on their journeys to the seaside. The tunnel is now part of the network of Taiwanese cycle paths.